Dave Bloodfield writes horror novels that often contain some scientific basis. He has been a fan of the horror genre since his youth and has worked in the science field since graduating college. He is currently working on a sequel to this story. 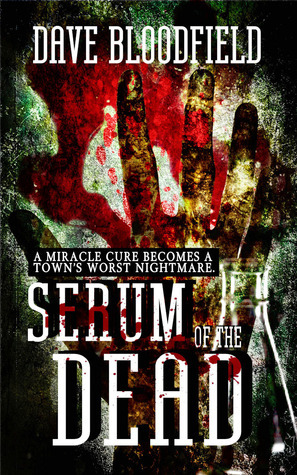 Serum of the Dead is the tale of a medical experiment gone awry, resulting in the infection of an entire town in up-state New York. As the dead rapidly reanimate to consume the living, a small group of survivors join forces to outwit the voracious zombies that have taken over their homes and must learn to work together to see a new day, discovering along the way that it is not just the monsters outside the boarded up windows they should be worried about. From the outset of this story it is very evident that Bloodfield is comfortable writing about his own area of expertise, as the lead up to the undead apocalypse is rife with believable scientific mumbo-jumbo and his explanation for the reanimation of the dead and their subsequent anti-social behavior is most excellent and something I had not heard before. Sadly, however, that is where my enjoyment of this novel ended. Structurally, the story unravels exactly as you might think it would if you spent the 80s watching zombie flicks, which this story echoes to great effect. Unfortunately though, Bloodfield struggles to create believable characters who react appropriately to the situation, and the number of flirtatious flings and sudden coffee breaks during what should be a desperate battle to survive seriously detracted from the plot. There was a lack of imagination applied to the (joyfully numerous) deaths, most of which consisted of ‘flesh being ripped by teeth’ and the novel on the whole could really do with another editorial pass as the grammatical errors are too numerous to ignore, including the usage of wrong words in some instances. At the end of the day I wish I could recommend Serum of the Dead but I can’t justify spending money on a great idea poorly executed. The bones are there, but the flesh is hanging off.